Cuts of beef come in a variety of shapes and sizes. Their location and function on the animal has a profound influence on the texture and flavor of the beef. The most tender and highly sought cut of beef is the tenderloin, from which beef medallions are cut. 1. Season beef medallion in salt, crushed black peppercorn and mustard. Pan grill in grill pan for 10 minutes or as desired. Set aside. 2. Melt chocolate in sauce pot and add aujus from grill pan. Add chicken stock. Season to taste. 3. 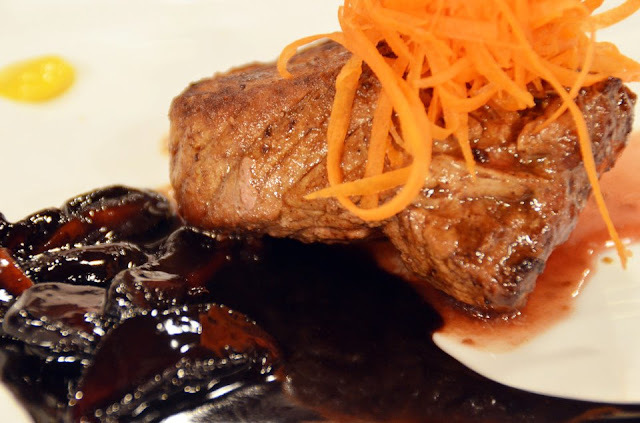 Arrange beef medallion, over the top with chocolate gravy sauce on platter.